How do you spot an innovator and what does it even mean? For me it is someone that addresses the needs of the future by reading and understanding the signs of today. The great thing is that innovation comes from all countries, fields and areas. It can be a person, an organization or a company. Today I want to focus on Hometown Harvest, a company that was selling ugly fruits at a cheaper price before Intemarché launched its Inglorious Fruits and Vegetables campaign. 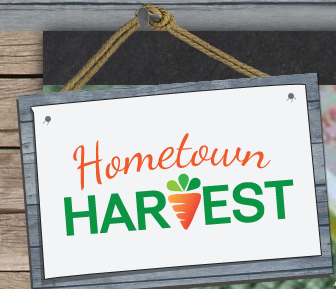 You see, Hometown Harvest is one of the original adopters of such an idea and has been offering this service to customers every few weeks. Its clients and customers can buy uglier produce in bulk at discount prices and use the goods in canning, baking pies or anything else their hearts desire. Considering that eating healthy is something on everyone’s mind these days, such offers are becoming popular! Whether this change is driven by GMO labeling campaigns, farmers’ market trends, or the cold facts of science, which reveal the dangers of processed food, people are listening! Since most stores avoid offering cheaper items in fear they will lose profits from their regular line, we wanted to ask Hometown Harvest about their experience. Founder Tony Brusco answered our questions and explained his strategy. A fun fact about Tony: he is also a farmer! This makes him very aware of what it’s like to be on all sides of the agriculture business: as a producer, retailer and consumer. Can you give us a little history about the 2nd philosophy? Honestly, offering seconds for canning and sauce is very common in the agriculture community. We began to offer it about two years ago, simply because we had a pile of fruit that was good, but simply not pretty. It was really a shame to have it go to waste, so we began to offer it as an option. 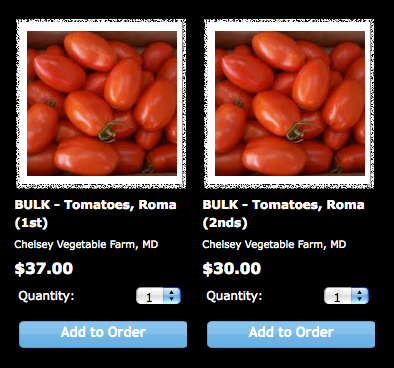 Last week, there were some weeks we had more orders for 2nd than we had produce to give. So offering this, has helped farmers get something for the 2nd and helped our customers get a great deal. Did something specific spark this idea for your business? Eating healthy is something on everyone’s mind these days. When I was a vendor at the farmers market, I would often buy a case of tomatoes like this, so that my wife can put them away for winter. We have offered these [2nd produce] for a couple of years. Why incorporate 2nd into a business? Offering 2nd to our customers helps the sustainable farmers in the community (which in turn allows them to keep farming, and continue to take steps to become more sustainable). It finds a home for really good food, that otherwise would be tossed. And it helps to overall reduce food waste. How does this connect to sustainability and food waste? One of my personal goals with our business, is to become a zero food waste facility. We are very close now, but are not 100% yet. I, like you, hate to see any food go to waste. There is no reason why that produce item cannot be donated to a food bank, or converted to animal feed. Some companies or organizations are afraid their business will suffer if people start buying more produce at a discount. Does it affect your business? Not really. I feel that these products are being purchased for a specific purpose. I also see this as a “perk” for being a customer of ours, and being so connected with local farmers. Is there a specific type of produce that can be sold as 2nds? We offer seasonal items. So we only carry what is in season. Therefore, the list of ends that is offered is restricted to what we have. During the mid to late fall and winter you will not see tomatoes, but you will see apples and carrots for example. The list is not huge primarily because in some case, a product goes from great to really bad in a very short period of time. Offering #2 of a product is fine. It is an item that I believe is still great, just not pretty. That is different from offering a product that is on the border of being bad. What happens to the produce that doesn’t get sold even as 2nds? Is it donated? Really depends. If the item is sorted out on the farm – typically the item is composted or left in the field. If the item comes to us, [that] item is ether donated to a food shelter – we work with Martha’s Table and the Frederick Rescue Mission, or if it is in bad shape, tossed. In the near future, produce in this shape, will [be] fed to pigs – we currently don’t have an outlet for this yet. Do you educate your consumers about being more flexible when buying produce (ex: produce is delicious even if disfigured), or how to know if something is good or bad? With the exception of our #2 – we aim to provide high quality produce. If an item is a little ugly – yes we will do some education – and for the most part our customers are ok with this. They are supporting local farms, and understand that not everything will be perfect. Whether you do educate them or don’t, do your customers show any interest in this (sending you stories, asking questions, etc)? They show interest by purchasing ends or buying the ugly carrots. They do not typically share stores, although I am sure I have heard a few over the years. After starting this 2nds campaign has the behavior or awareness of customers toward wonky food and food waste changed? Not really. Again we have offered this for a few years now. In the beginning we might have had some positive reaction to us offering 2nds, but at this point, our customers know that we offer this at certain times of the year. Are there any figures or percentages that demonstrate how the 2nd campaign impacted your business? It is hard to nail down % of sales increased through this offering. I can tell you that we typically sell a few thousand pounds of ends each year. I want to thank Tony and Hometown Harvest for talking to us and sharing the story of their innovative work. I also want to thank my friend Angela for introducing me to their work! I personally believe that innovation can come from anywhere, at any time. The best part – once the new habit catches on it becomes the norm. I hope that more companies and stores adopt this practice, and that those who haven’t yet can create similar campaigns and spread awareness. The hope is that these campaigns grow into something more solid and become a tradition, not just a passing trend. If you have any questions or know other organizations worth a mention, let me know. Posted on August 21, 2014 by saynotofoodwastePosted in NewsTagged food waste, innovation, intermarche, organic, supermarket. Previous Previous post: IceBucket Fun or Insanity? Next Next post: No Honey. No Money.